Another Millersburg rarity. This one is amethyst and was photographed while in the collection of the late Don Doyle. 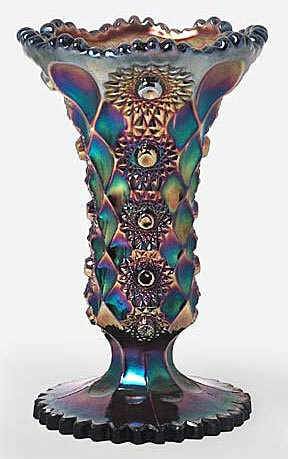 Marie McGee, in her 1995 book on Millersburg glass, reports that two are known in amethyst, one in blue, and possibly another in blue. In 2011, one of the amethyst examples sold for $10,000 and in 2014, there was another sale of an amethyst example for $11,500. Also in 2014, an amethyst example with a pinpoint on the base brought $4,250. In 2017, a blue example sold for $14,000 and an amethyst example sold for $9,000.